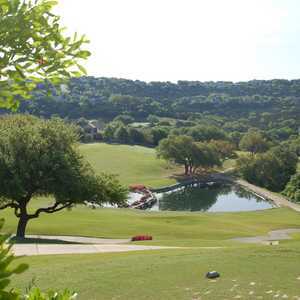 LAGO VISTA -- The two golf courses at Lago Vista, located just 45 minutes outside of Austin in the Hill Country, provide some of the most beautiful panoramic views of the hills and Lake Travis in the entire Austin area. No. 10 on Lago Vista's Highland Lakes course is one of the prettiest in Texas. While both courses provide similar views of the picturesque scenery, each has its own unique identity. Lago Vista's Highland Lakes Course is considered the more difficult of the two, according to Director of Golf Rusty Jenkins. "At Highland Lakes, if you hit a bad shot, you can pretty much forget your ball," Jenkins says matter-of-factly of the 6,529-yard layout, which is the newer of the two courses and opened in 1980. The tightness of the course becomes evident when you walk out of the clubhouse and step up on to the first tee box. The first shot of the day occurs on a par-4, 361-yard hole that includes a blind tee shot to a ridge that drops off to the green approximately 40 feet below. However, in order to get to the ridge, you must hit it straight. To the right and left are trees and just before the ridge is a bunker and a group of trees encroaching on the left side of the fairway, which force you to stay right with your drive. A straight tee shot on this hole will likely earn you a par and get your round off to a good start. No. 2 doesn't get any easier. This 348-yard, par 4 is over a valley off the tee to a fairway that slopes severely up to the hole. Be careful on your drive because trees lie to the right and left and bunkers protect the right side of the fairway. The second shot is blind to an elevated green. Following the opening holes and the various terrain on each, the next several holes are somewhat easier and are relatively level or downhill from tee to green. The next challenge comes on the par-5 sixth hole. 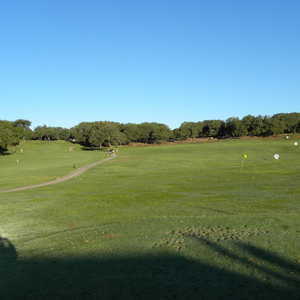 This 494-yard hole includes a narrow fairway with trees to the right and reachable bunkers on both sides of the Bermuda grass fairway. The second shot is to a green that has bunkers to the right and left, and that slopes back to front with a large ridge in the middle. Caution on this undulating Tifdwarf Bermuda green is necessary or a three-putt or higher is not out of the question. After the 194-yard, par-3, seventh hole, which features a scenic tee shot over a canyon and between a group of trees on the right and left, you are faced with another par 5. No. 8 is a long dogleg to the left that measures in at 524 yards. Off the tee you can hit driver to a valley that has several bunkers to the right. The second shot is blind and back up the other side of the valley to a ridge that levels out for a brief time and drops back into another valley. The third shot is generally a short iron to a green that is protected by four bunkers in front, and a rock wall that runs along the right and behind the green. Closing out the front side of Highland Lakes, which hosts 38,000 rounds of golf annually, is the par-4, 397-yard No. 9. This hole is just one of the many that provides beautiful views over the Hill Country and Lake Travis. The dogleg right offers you two options off the tee. You can: 1) hit a fade that will go around the corner and roll down the hill, or 2) hit a straight shot over the large hill on the right with the hopes that it clears the trees on that same hill and rolls back to the left into the fairway. Your second shot is to a green that has three bunkers protecting it. The back nine starts off in spectacular fashion with one of the prettiest holes in Texas, and quite possibly, the entire country. No. 10 is the signature hole at Highland Lakes and once you're standing on the tee box, you'll understand why. The par-4, 375-yard hole begins with your tee shot from an elevated tee box to a fairway that drops more than 100 feet in elevation in a stair-step pattern. A well-struck mid- to high-iron will put you on the last level with a short iron over the creek to the green, which has a bunker to the right. Make sure and leave your ball below the hole on this green that slopes severely from back to front. Although No. 10 is clearly the highlight hole on the backside, the remainder of the course is not without its challenges as well as elevated views of the surrounding topography. No. 15 provides both. This par-4, 324-yard hole requires a tee shot straight up the hill to a fairway with a blind landing area. Because the hole doglegs to the right, stay left off the tee and you will have a relatively short, second shot to the green, which is protected by large mounds around the entire green and a bunker on the right. 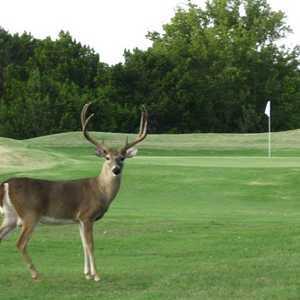 However, before you hit to the green, look back toward the tee box and the Hill Country is there for your viewing pleasure. No. 16 is another tough hole at Highland Lakes. This double-dogleg to the right is lined with trees on both sides and several fairway bunkers on the right. Anything right of the fairway will require a delicate pitch through the hundreds of tress and back to the fairway if you have any hope of reaching the green in regulation. After reaching the second turn on the hole, the hole is approximately 30 feet below with bunkers behind on the left and right. Following the 207-yard, par-3 No. 17, the finishing hole is a dogleg to the left. The 398-yard, par 4 features a large oak tree at the bend on the left and several fairway bunkers on the right. Your final approach is to a green protected by bunkers on the right and left. Since graduating from the University of Texas in 1992 with a degree in journalism, Kyle Dalton has been a writer and editor for a variety of national publications in various fields.